The SOTCW is a non-profit, international society established in 1989. The founding members were Mark Wheeler, Jim Webster, Mark Bevis, and Dave Allsop. 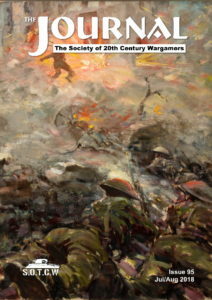 They founded the society to promote all aspects of wargaming 20th century periods. The SOTCW produces its own magazine The Journal (download a sample issue), and has a dedicated forum and Facebook group for discussions. Membership of the society is on a subscription basis, with members receiving copies of society magazine The Journal. You can try a free sample issue. Originally The Journal was typed and photocopied in A3 size and folded. From issue 7 onwards it became A4 format in black and white, and stapled together. From issue 83 onwards it has been available in both print and electronic format. To contact a team member, see the contact page.